A compression test will give you a general idea about the condition of the top end of the engine. It’s a good idea to do a compression test before doing any engine maintenance or servicing. If the compression is low, synchronizing carburetors or changing the engine oil will be of no value until the cause of the low compression is identified and corrected. Keeping a written record of the compression will provide a history of the engine’s condition and may point out a developing problem. Remove the spark plug of the cylinder being checked. On a multi-cylinder machine, check each cylinder individually. Note: If the engine has two spark plugs per cylinder, remove only one of them. When measuring compression you will need a compression gauge with the correct size adapter to perform this task. There are three size spark plug holes currently being used, 10 mm, 12 mm and 14 mm, even on American made vehicles. Install the adapter hand tight being careful not to cross-thread it. Hook the gauge to the adapter and hold the throttle wide open. 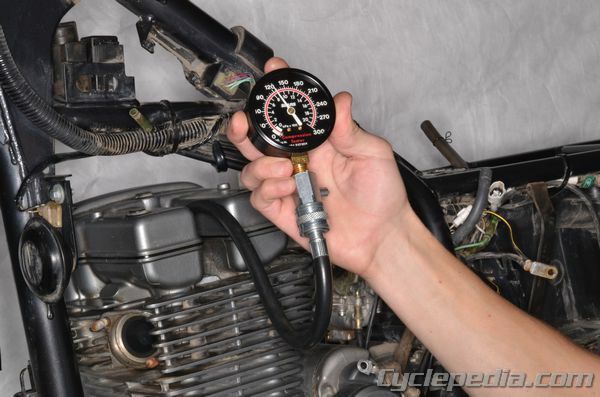 Using either the kick starter or electric starter, crank the engine until the needle on the compression gauge stops rising. See the video below for a demonstration of a typical compression test. Check your service manual for the compression specification. Many motorcycles and ATVs have automatic decompression devices that may cause lower compression readings than vehicles without such a device. A low reading is a possible indication of tight valve clearances, damaged piston and/or piston rings, poor valve seating, leaking cylinder head gasket or a worn cylinder. If the compression reading is low, remove the compression gauge and add a few drops of engine oil into the spark plug hole. Recheck the compression, if it has increased significantly, the rings and/or the cylinder are worn excessively. If the compression does not increase, either the head gasket is leaking or one or more valves are not sealing. Check the valve clearances before disassembling the engine.